Dane Arts held their inaugural Dane Arts Buy Local (DABL) Night Market at the US Bank building on the Capitol Square last night. 27 artists were selected to participate in the event, and there was also a panel discussion on “The Art of Business and the Business of Art.” Although I missed the first half of the panel discussion, I think overall the event was quite successful in term of the crowd there and the energy people brought to the space. It felt more like a trade show (well, technically it can be called a trade show) than any art fairs on the street. 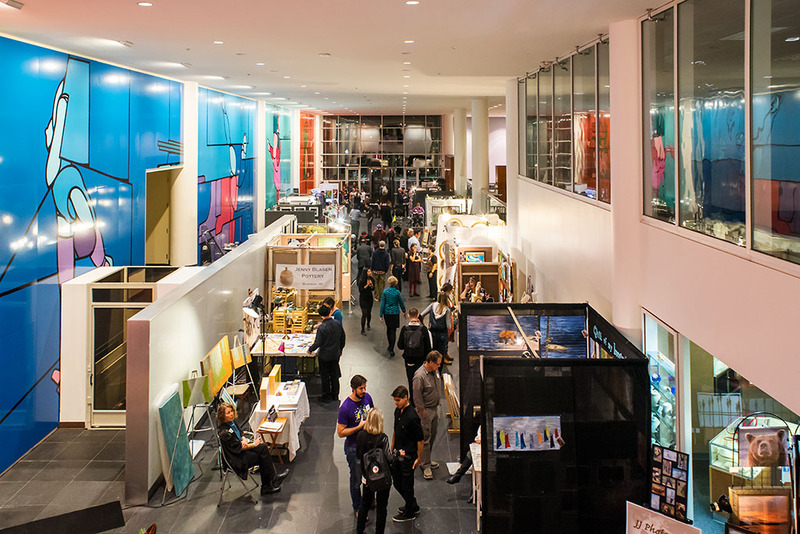 One of the emphases of the event was to connect businesses with local artists so that, for instance, when people are looking for artwork to decorate their corporate office, they would know where to find them or whom to commission, or even better, they can purchase the art right at the event. It’s a great idea, but I don’t know how efficient this event was to facilitate more sales than traditional art fairs. I would suggest Dane Arts to run a survey from the participating artists to figure that out, and I think many people would be very interested in the results. Regardless of the sales figures, I did enjoy the event. I was there from the beginning to almost the end, talking to more than half of the artists and learning more about their work. As an artist, I found that a fascinating experience, and if Dane Arts is going to hold the event again next year, I will definitely apply for it. As a business owner, I could see some of the artwork that may be suitable hanging on the wall of my future office, and I might even commission one of the artists to make a signage for Snowforest. And as a photography service provider, I was also trying to figure out possible ways to promote these local artists especially through photography, and subsequently through other channels. One of Snowforest’s missions is to promote artists, which is part of the reason why we joined CODAworx. Not only do we want to help artists make more sales to the local market or get more commissions, we also want to push local artists to the next level and be able to sell beyond local. In addition to events like Dane Arts Buy Local, I think an online market place will be tremendously helpful to make these artists’ work be seen by more people. Perhaps Dane Arts can work with the developers at 100state to make it happen.